Following the announcement of positive results of the phase 3 CAPSTONE-1 trial at IDWeek 2017 in San Diego, Japanese pharma manufacturer Shionogi has annouced that baloxavir marboxil (S-033188) can effectively kill the flu virus in a single day—making it faster-acting than any other flu drug available, including oseltamivir (Tamiflu), which typically takes 72 hours. A novel cap-dependent endonuclease inhibitor with potent anti-viral efficacy for influenza, baloxavir marboxil demonstrated significant improvement in time to alleviation of symptoms (TTAS) and reduced virus levels in patients compared with placebo in CAPSTONE-1, according to Shionogi. The therapy showed excellent in vitro and in vivo antiviral activity against both A and B viruses and is active against both H5N1 and H7N9 avian influenza viruses with a single 1-time oral dosing regimen. CAPSTONE-1, a randomized, double-blind, parallel-group, multicenter, placebo- and active-controlled study, enrolled 1,436 otherwise healthy patients diagnosed with influenza. Patients 20–64 years old were randomly assigned in a ratio of 2:1:2 to receive a single 1-time oral dose of 40 or 80 mg of baloxavir marboxil—according to body weight—a placebo, or 75 mg BID of oseltamivir for 5 days. Patients 12–19 years old were randomly assigned in a ratio of 2:1 to receive either a single dose of baloxavir marboxil or a placebo. Those who weighed less than 80 kg received 40 mg of baloxavir marboxil, while those who weighed more than 80 kg received 80 mg. Eligible patients needed to be otherwise healthy, have uncomplicated symptomatic flu—defined as an axillary temperature of at least 38°C, and have at least 1 respiratory symptom and 1 systemic symptom—and be no more than 48 hours from onset of symptoms. The researchers monitored changes from baseline in virus titer, time to cessation of viral shedding and time to resolution of fever and a return to pre-influenza health status. 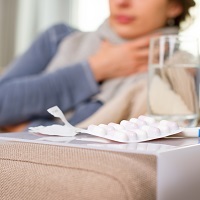 The percentage of patients determined positive for influenza was significantly lower in the baloxavir marboxil group compared to the oseltamivir group at 1, 2 and 4 days from baseline in virus titer. Additionally, the time to cessation of viral shedding significantly decreased in the baloxavir marboxil arm, 24 hours, versus 72 hours in patients treated with oseltamivir, and 96 hours in those who received the placebo. Baloxavir marboxil recipients experienced a significantly faster resolution of fever versus the placebo, 24.5 hours versus 42 hours. Time to return to pre-influenza health status, 1 of the more important endpoints, was 129.2 hours in patients who received baloxavir marboxil and 168.8 in patients in the placebo arm, a difference of almost 40 hours. The inhibitor demonstrated superiority to the placebo in TTAS, with a mean of 53.7 hours versus 80.2 hours in the placebo group. Overall, baloxavir marboxil was generally well tolerated with lower overall incidence of adverse effects (20.7%) versus the placebo (24.6%) or oseltamivir (24.8%), and demonstrated a significant decrease in the incidence of treatment-related adverse effects compared with oseltamivir. Similar TTAS findings occurred between baloxavir marboxil and oseltamivir groups, however, significant improvement was found compared to the placebo or oseltamivir for important virological endpoints. While the clinical findings are similar, the virology in baloxavir marboxil is much better. Based on CAPSTONE-1 results, Shionogi plans to submit a New Drug Application (NDA) to the Pharmaceuticals and Medical Devices Agency (PMDA) in Japan this year, and a US NDA is also planned. Another global phase 3 study, CAPSTONE-2, is currently underway in individuals at high risk for influenza-related complications. Nonclinical studies of baloxavir marboxil demonstrated its anti-viral spectrum against not only seasonal influenza strains but also oseltamivir-resistant flu strains and avian flu strains, of which potential outbreak is a global public health concern. Shionogi detailed key findings in a company statement.